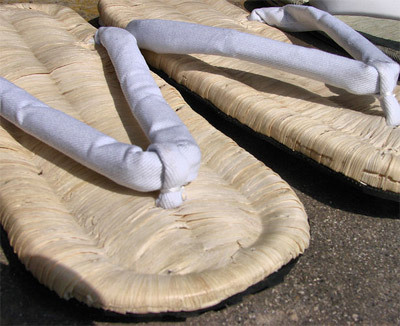 These handmade zori sandals are of the best Kyoto quality. 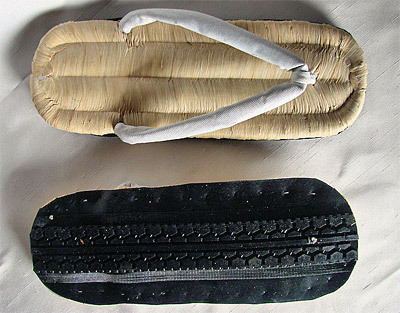 Made of rustic-style woven straw in two panels with white velvet thongs and tire rubber soles. 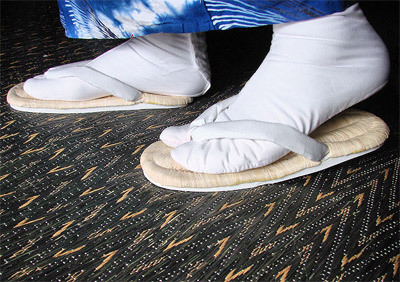 These handmade zori sandals are of the best Kyoto quality. Made of rustic-style woven straw in two panels with white velvet thongs and tire rubber soles. Depending on the supplier the sole may be black or white. Comes in two sizes. Best worn with our tabi socks. The rounded style of the zori makes them more commonly worn with a kimono by women in Japan, but there's no reason why they can't be unisex!